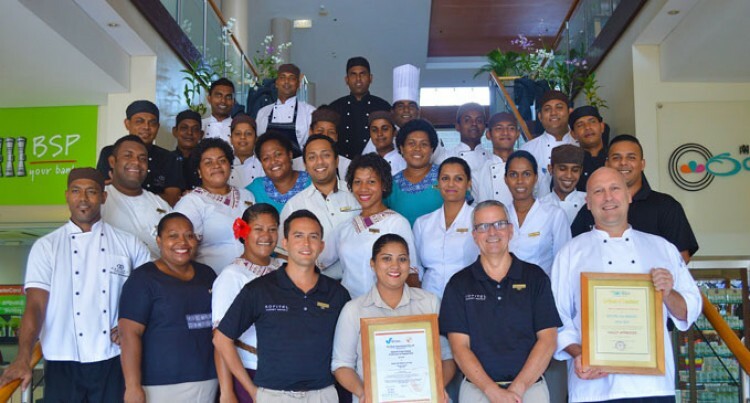 Sofitel Fiji Resort & Spa staff members and executives with the HACCP accreditation and certification. Sofitel Fiji Resort & Spa on Denarau Island has become the first resort in Fiji to comply with the highest international industry standards to receive HACCP accreditation and certification. Sofitel passed the final audits by the Fiji Government’s Ministry of Health after successful implementation of the stringent food safety system HACCP. Sofitel Fiji Resort & Spa general manager, Alan Burrows, said: “This has been a huge undertaking and we are very proud of the entire resort. Achieving HACCP Certification is not an easy task. Hazard Analysis and Critical Control Point (HACCP), being a detailed system of food safety analysis and monitoring, it is being broken down in various parts. This is to make it reliable from the moment food arrives hotel premises, until it is being served as a ready to consume product. It involves various departments, including procurement, receiving, kitchen, F&B service. It prioritises receiving with cold storage and temperature control, labelling with dates and shelf lives, internal cooking temperature, chilling and reheating hot foods, and serving.